There you are, in one of the great game parks of Africa, Etosha National Park, and the gates close at sunset. 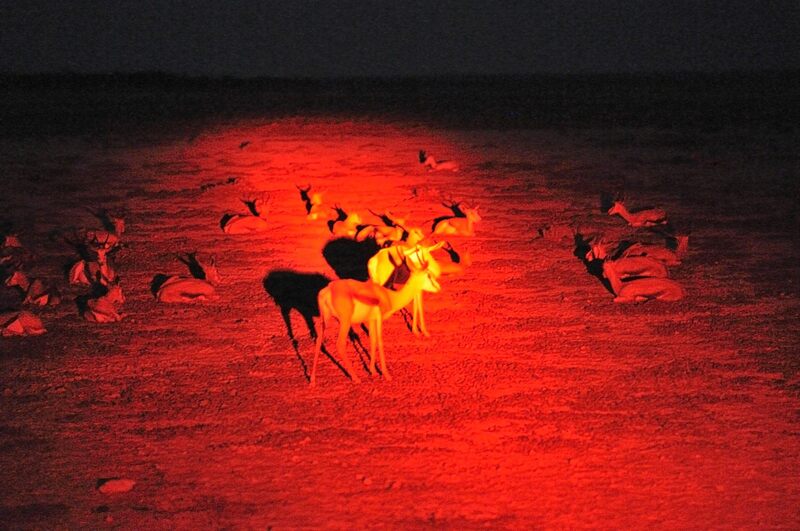 Fortunately Namibia Wildlife Resorts have come up with an innovative solution: night game drives. Samuel Hilundwa is one of two guides at Namutoni who specializes in night drives. Ask him why and he will say because he loves it. His most exciting night was when a lion took a black faced impala. As a guide, Hilundwa likes to give value for money, and the tourists are usually thrilled by the drive. Although most consumer cameras can’t capture the action at night, “the mind still has it,” says Hilundwa. He came to the job a year ago after working for Gondwana, and he is keen to upgrade his knowledge. He studied guiding in Windhoek for a year to grade three with NATH, the Namibian Academy for Tourism and Hospitality; and although the course gave him a solid grounding as a guide, he says that working in Etosha has built his knowledge more than anything else. As the open Landrover swings off the road and follows less travelled tracks, Hilundwa lifts a spotlight with a red filter and searches for game. Tonight he can smell elephants and, of course, they can smell us. But it has rained in the park – despite the drought Etosha had some good rainfall – and most of the elephants have moved away. All we see is fresh dung. But never mind; we soon find giraffe, and then rare black rhino at a water hole. There is a din from the bullfrogs. Like all good guides, Hilundwa has lots of local knowledge and he talks about cooking bullfrogs. In the dry season they are dormant in the mud, but when the rains come you can catch them and boil them. The skin tastes “lekker”. Back inside the gate we are safe, and can take a nightcap before a comfortable night’s sleep – and a daylight game drive in the morning.